When talking about ‘voting with your dollar’, we often talk about purchasing habits with specific brands or products, encouraging consumers to opt for the more sustainable and fair option when shopping. Another key player in our shopping habits are the grocery stores that we shop at, and learning more about how they source their products. Oxfam recently published a report, "Ripe for Change," that examines how workers in grocery store supply chains are treated. The report revealed that grocery store supply chains exploit millions of vulnerable workers, including farmers and fishermen. 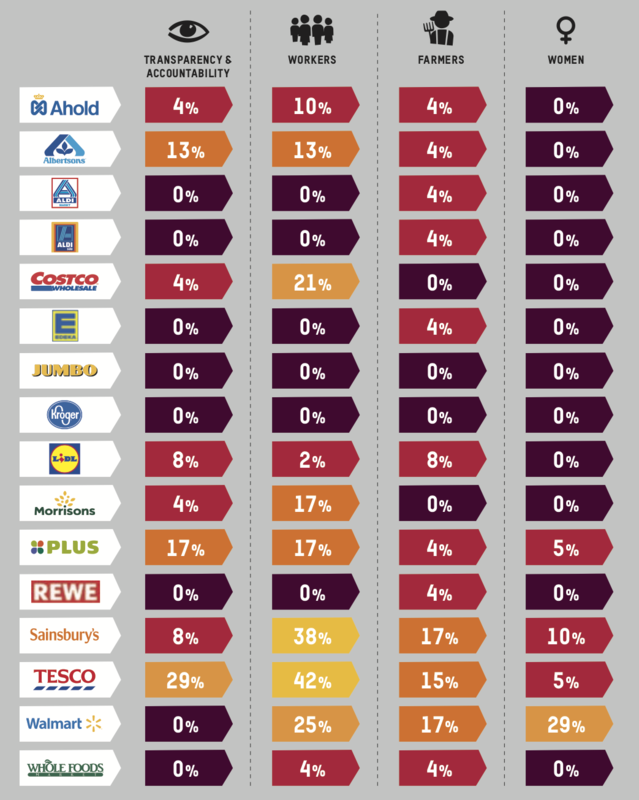 Increased consolidation of grocery stores and food retail chains: Over half of food retail sales in the European Union are from just ten supermarkets. This gives the supermarkets enormous influence within their supply chain, especially when it comes cutting costs. Prices paid to suppliers are decreasing: A mix of supermarkets cutting costs and insufficient government support is leading to increased hardship amongst producers within supermarket supply chains. Suppliers of major commodities are not earning a living income, and many farmers cannot afford to feed themselves and their families. Supermarkets receive the largest cut from consumer purchases within the supply chain: Supermarkets earn 30.1 percent of what consumers pay for goods. Meanwhile, farmers (both small-scale and large plantations) earn 13.9 percent. In addition to these findings, Oxfam rated major American and European supermarket chains on their policies regarding transparency & accountability; workers; farmers; and women. The scores are based on publicly reported reports from the companies. The chart demonstrates the need for companies to develop strong policies that align with international recognized best practices and support the most vulnerable workers in their supply chains. How can consumers help pressure supermarkets adopt better practices? Oxfam suggest reaching out to supermarkets and asking them to protect and respect workers in global food supply chains by implementing practices such as investing in projects to improve farmer income, increasing transparency within supply chains, and conducting human rights due diligence in compliance with United Nations Guiding Principles on Business and Human Rights. Green Americans can also ask grocery stores to carry brands that do have responsible supply chains, as well as opting to purchase products that are sourced more responsibly. Grocery stores track information about what their consumers are purchasing – and by voting with your dollar for more sustainable and ethical brands, you’re signaling to grocery stores that this issue is important. Finally, consumers can ask their favorite brands to become more sustainable and fair with their sourcing practices, whether by taking action such as signing our Godiva petition or directly reaching out to companies.